That's the Japanese short form for "Rice topped with omelette and demi-glazed sauce." I've told you already before about how the Japanese like demi-glaze sauce. And here again, as you can see, they serve this with spoon, and I think to them this is not Japanese food. To me though, it has the kind of taste that you can only find in Japan. It was a little bit sweet. It was nice, but I never liked the idea of eating "omu raisu" without any other fried meat (like hotdogs, bacon, ham, corned beef which they call as hashed beef or "hashudo biifu" here, or Spam) to go with it. But again, I'm just glad I've tried it once. It is an expensive 498 yen bento though from 3F. As you can see there are some herbs sprinkled on the omelette, plus inside there are bits of mushrooms or lotus roots, and one very tiny bit of meat. The rice is also flavored; it was a little bit orange-reddish. With this for dinner, and the shrimp-asparagus spaghetti for lunch, I almost had a no-meat day today (if you don't count the shrimp and the eggs as meat). I guess that's great. But let's see how hungry I will be by around 11:00pm tonight. This is a new, special/seasonal dish; 450 yen from 3F. My Japanese friend says this is (almost) the typical/standard Japanese-style curry. There's small beef bits in there, and lots of mushrooms, and potatoes and carrots and pickled radish, of course, which probably make a Japanese-style curry standard. Overall, I liked it, except maybe for the price tag. As usual, they give you a spoon although technically you can eat this with chopsticks because the rice is Japanese sticky rice. 430 yen from 3F. The seafood is only actually some mussel (shellfish) meat, as you might observe. I knew it wasn't going to be enough so I got me again a chicken stick (120 yen). I just found out that the chicken stick is not one solid cylindrical stick of chicken. It's actually a hollow cylindrical "tube" with mayo in the vacuum. Still, not bad for 120 yen, I think. In the spaghetti, there are some chopped chilis, and the sauce might be considered a white sauce but not really cream-based, and more likely (olive?) oil-based. I am not sure though if this is a "wafuu pasuta" (和風 or Wafu Pasta, where wafu stands for Japanese-style), but it didn't say "wafuu" on the label. "Fuu" (風) means style in this context, but it is the same sound and symbol for wind in some contexts, like "fuudo" (wind tunnel), although it might be pronounced "kaze" in other contexts where it is meant to be used as wind, like "kaze kougaku" (wind engineering). And as I've told you before, they rarely call spaghetti as supageetii; instead they more often call them just simply pasuta (pasta). Bento #40: "Mikusu Furai Bento"
If you read that out loud, that would sound like "mix fry bento." But "mikusu" could also mean "mixed," in the same way that here, they would say "furuttsu" that means "fruits" or "fruit." Anyways, it's rice with some herbs, with spaghetti with red sauce as a garnish, and deep-fried breaded mackerel fish, ebi (shrimp), chicken, and ham+cheese, topped with tartar sauce (for the seafood) and some sweet tonkatsu sauce (for the chicken and ham). 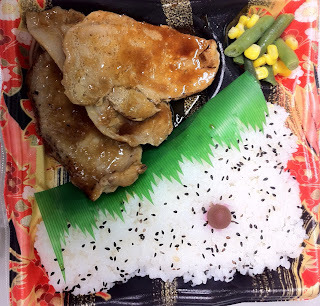 This is a special/seasonal/limited-time bento offering at 3F for 530 yen. There's still about 4 days to go in August, but the Japan! Japan! blog's number of pageviews has already exceeded that of last month's. As you can see in the graph above, it's my second record month in a row. And for the past 30 days, I have had almost close to 2000 pageviews, making my total pageviews for this blog just recently pass my previously number one engineering blog. 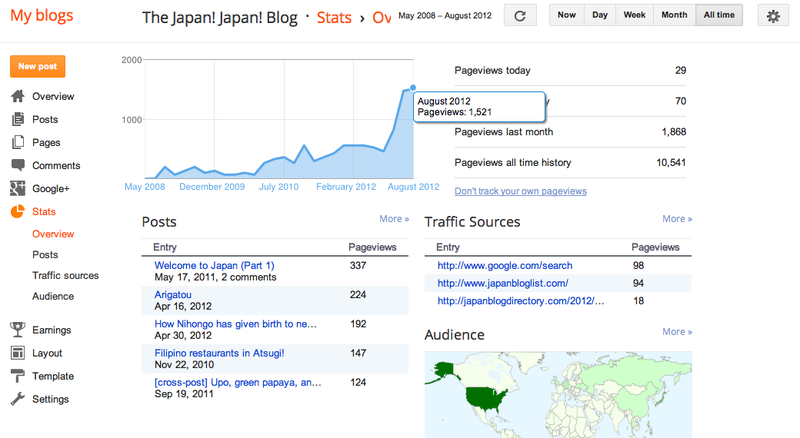 I should make a special shout out to our visitors through The Japan Blog List (JBL), which at this point is already the blog's second best source of traffic. And that is considering I applied to be included in the list just a month ago, I think. In that sense, I guess JBL is definitely a good resource for all of you new to Japan or interested to read up about Japan-centric stuff. 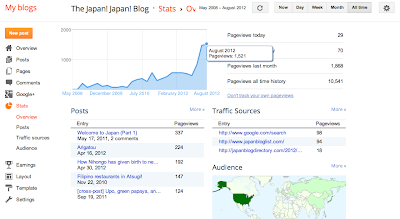 At third place, of course there's the Japan Blog Directory, also a very useful resource for those new to Japan, which started all this big jump in my pageviews. Of course, my shift in topic to mostly about food and my extensive use of photos, and also having a presence on Twitter, Facebook, and Google Plus has all helped, but it is all nothing without your patronage and frequent revisits. So, once again, DOUMO ARIGATOU GOZAIMASU! I saw these frankfurters at the supermarket and could not resist. meal, all for just under 400 yen. I like ice cream especially when it's hot and I saw these. I can read "ichigo shibure," but it's just "ichigo"
He talked about why he started to study Japanese and why he thinks it's important to learn how to read Hiragana and Katakana and not just rely on the Romaji all over the place nowadays in Japan. And finally he lists some podcasts that he listens to that have helped him improve his fluency in the language. Nihongo Ichiban, by the way, is a good resource for learning Japanese. Midway through the sandwich (and fries). Or "baffaro- chikin sando." Got an "L" upgrade to the sandwich "setto" (set meal), plus the 200 yen chicken tenders, this was a whopping 990 yen but overall a really good meal. I got barbecue sauce with the chicken tenders. Overall, I like the BK Tenders better than Mickey D's McNuggets. The sandwich's sauce was great, but it just felt more like a spicy garlic-cream sauce, but then that's probably what "buffalo chicken" should really be. In the sandwich, there's bell peppers, lettuce, tomatoes, and cheeeeeze as well. Actually, I wasn't able to jot down the exact name of this bento meal, but as you can see it is generally (Japanese-style) Chinese food. One piece of shuumai (dumpling), half a spring roll (with vermicelli noodles and apparently something like potato inside), the main chicken dish with lots of spring onions and light sauce, rice with some sprinkling of some green veggie, and vermicelli-carrots-mushroom-corn side salad. Notice there's some sort of sauce (little bit sweet) on the shuumai and spring roll. If I'm not mistaken, this was 498 yen from 3F. Quite good, not the best, but interesting nonetheless. After so many months of craving for real KFC chicken, I finally had the chance. I was on my way to a 1pm mass in Church and I was early enough to Honatsugi so I had lunch first. I ordered a "BOX" set, which comes with a drink, fries, a chicken sandwich, and a leg part. I upgraded the drink to "L" size, and this cost me a hole in my pocket: 900 yen. Note that here in rice-loving Japan, they don't have rice on the regular menu (as they do in the Philippines and probably other Asian countries). KFC, by the way, is known as "Kentakkii Furaido Chikin" or simply "Kentakkii" in Japan. Thanks to RB for sharing this link! Beef in "egg yolk sauce." Yummy. There's cold soba with some noodle sauSe. Green mango salad and fresh fruits. Yum. Haagen-Dazs vanilla again for dessert. Yum. A chicken dish that is more like a Chinese dish. It's actually a chicken burger with Masala curry sauce. There's cheese, too, and, I forgot what else. A little bit spicy - this is the Mild variant. They also have a Hot variant. If you like curry, you might like this. The Basil Mayo dip isn't great; I wouldn't have one again. With "L" coke and fries, this is all 800 yen. Bento #36: "Kissaten fuu no Naporitan"
Napolitan (spaghetti), coffee-shop-style. (Kissaten = coffee shop; ~fuu = ~style, although the same kanji and sound also means "wind" in some instances, such as fuudo = wind tunnel) 360 yen and yummy from 3F. The spaghetti sauce is probably a little sweet, but it was perfect for me. I honestly just love tomato-based spaghetti sauce. It came with some eggs, ham, mushrooms, and onions. Also had cucumbers (190 yen) that surprisingly complement it very well. The cucumbers are salted, possibly lightly-pickled, sprinkled with some white sesame seeds, and also doused with a few chili flakes but it's far from spicy. Overall, it was perfect, and in fact makes for a good (but expensive) snack by itself. The Japanese could and would eat "pasuta" (pasta / Italian noodles, which most often means spaghetti) with chopsticks, but they of course know how to use and actually use forks as well. When I ordered these, I was given a choice whether I wanted chopsticks ("hashi") or a fork ("fooku"). Honestly, I don't mind eating spaghetti with chopsticks. Bento #35: "Buta Sutamina Don"
This is the pork equivalent of the "Pawaa Don" (or "Power" Rice Bowl). Buta = pork, sutamina = stamina, don = short for donburi which means bowl (in this case, a bowl of rice). This one is 460 yen from 3F, delicious but not the greatest. I guess it's the egg that makes this a "stamina" don. Before you eat it, you have to take out a sheet of plastic that separates the pork+egg from the rice. Bento BreakTime #25: "Karaage to Hambaag"
Karaage (Japanese-style fried chicken nuggets/balls) and hamburger (pork) with some shredded cabbage, 294 yen from the cafeteria. I used pickled plum salad dressing, which is interesting. I dipped the karaage in J-style mayo. Together with the L-size rice, this is 441 yen and over 1000 calories totally. Shoved it all down with free, drink-all-you-can tea as always. I should mention that I love the cafeteria karaage much much more compared to the konbini or suupaa (convenience store or supermarket) version. Thanks to Rei for the photo! Or "Kyabetsu Chaahan" in Japanese. 460 yen from 3F. There's 3 pieces of shrimp and some small pork bits. "Chaahan" is similar to "Chow Fan" in Chinese, which basically means fried rice. Obviously "chaa" means fried, as in "Chow Mien" which is essentially fried noodles, and "han" means rice. Delicious in a Chinese kind of way. Little bit oily, but I guess you get what you asked for. Not enough though, so I ate this with a chicken-egg-cabbage salad with sesame-miso dressing. Oh and notice the Chinese-style soup spoon that is served with this dish? That kind of spoon is called "renge" in Japanese. They call the "normal" silverware spoon as "supuun." 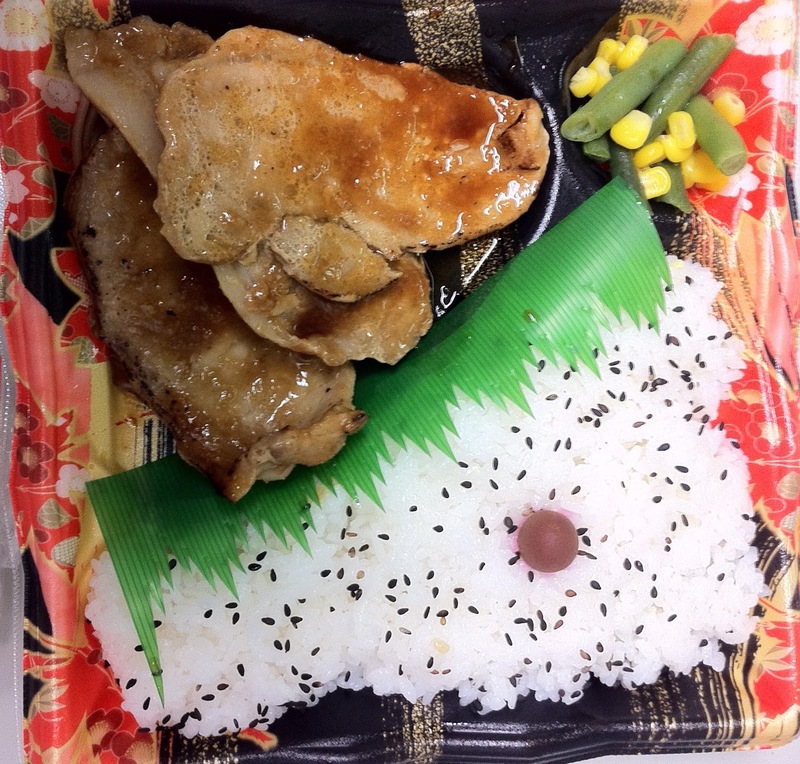 "Teriyaki Sauce Pork Cutlet Rice Bowl," or "Teriyaki Soosu Katsudon" in Japanese, "L" size, is I think 441 yen from the cafeteria. Comes with some shredded cabbage which I poured some "Chinese-style" salad dressing on. 498 yen from Lawson. A bit expensive, but it's a rather large portion of chicken so I had me another batch of rice after the one here. Came with some soba, rice sprinkled with some green herbs, and pickled radish. Oh, and this came with Katsu Sauce and a bit of Lemon Juice which I poured over the chicken katsu. The roast chicken included here sells for around 250 yen if bought separately, but this whole set is just 398 yen, from the supermarket. There is so much of the chicken that I had another batch of rice that is equal in amount to that already included in the bento. With the rice and roast chicken, there's also some sotanghon-like vermicelli noodles and mushrooms and carrots siding, some cabbage and lettuce, pickled plum, rolled fried egg, that pink and white thing that I usually find on some ramen and that is usually made from egg as well, and some sesame seeds and a "protective" plum on the rice. For around 465 yen (including the cost of the extra rice), it was a very good meal. I found this nifty weather widget that could show the weather right now in Atsugi. Come back here if you're interested to find out what it is like in Atsugi right now. You can also move around to see the forecast for the next few hours, or for the next few days. Of course, it's not always accurate. If you want one for your own website or for your own city, click the link to the widget's developer's website. Actually they also have a Google Chrome browser extension that I highly recommend as well. At around this time, it's way hotter and just as humid in most of Japan than in the Philippines. 360 yen. Onigiri is that triangle-shaped rice+something wrapped in nori on the left, which you can usually find in convenience stores for about a hundred each although slightly larger than the ones in this picture. They're the equivalent of sandwiches in the western world in that they serve as quick lunches on some occasions. This one's not a quick lunch though, as the 3 pieces of onigiri come with an assortment of stuff: small (pork) burger patty, squid, fish, chicken, hotdog, and egg. The 3 types of onigiri have a mayo filling, tuna, and… plum? or some other kind of seaweed. Yummy, all around. Partly opened because I was already opening it when I thought, I should take a photo! This is just around a 100 yen, I think, from the supermarket. Tomato sauce tasting yakisoba? I'd just call this spaghetti, but here in Japan, they call certain noodles soba and certain ones spaghetti, even though they look almost the same to me. 460 yen, if I remember correctly, from 3F. 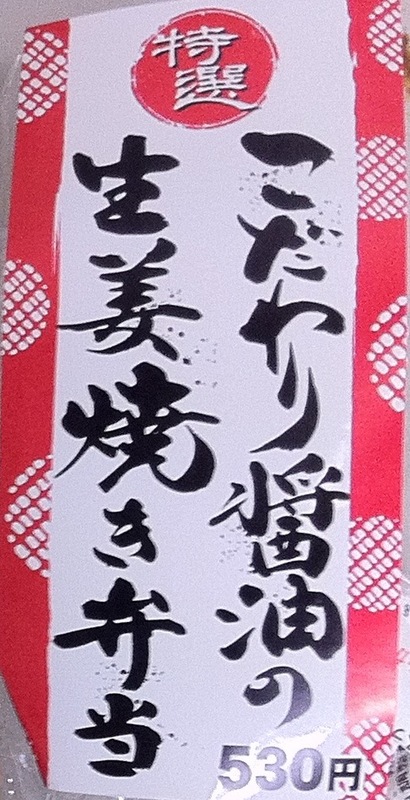 It's actually "supaishi indo-fuu masara karee" in Nihongo. Chicken, some veggies (spinach? ), pickled radish, rice, and the masala curry sauce - which tasted really a lot like Indian curry. I've been wanting to go visit O.M.G. Burgers for a long time now, but it's about a 45-minute, 4.5-mile, 7.24-km bike ride from school, plus there's a lot of steep slopes and rolling terrain along the way. And then you have to go back the same way. It's actually outside of Atsugi already; it's in the neighboring Aikawa City. Obviously, burgers are their specialty, and they even have a 12-inch burger which you should pre-order a day early before going there. You can check out their menu below. That's Nihongo for "Power Don." Power Don is basically a rice bowl with beef toppings and an egg. The M-size is around 845 calories. I got the L-size though together with some okra in mashed radish, and it was close to 1000 calories and about 493 yen in total. It's quite a good meal for me. The Power Don also has some leeks and garlic stalks, by the way, and the egg is soft boiled and usually I'd mix it with the rice and beef. Yum, yum, yum. The rice below. Not so much though. Everything together. Called "Gyuu Suji Karee" in Nihongo. Close-up view of one piece of "suji." A special curry dish from 3F - 498 yen! "Suji" translates to muscle or tendon, but the stuff in here felt more like boiled-until-tender ligaments. Quite an interesting and tasty dinner, but a little bit expensive as always. Yayoiken is a restaurant that's just a little bit better looking than the usual Yoshinoya, Sukiya, or Matsuya. Like many places here, you pay for your order at a vending machine right by the entrance. The prices are also just a little bit more expensive by about 200 yen, maybe. We usually eat at Yayoiken because they have eat-all-you-can rice and pickled radish. But for breakfast, they have really cheap offerings like the two above. 398 yen from 3F. "Gyuu karubi yakiniku bento" in Nihongo. Yummy in my vocabulary, though quantity-wise it's not so much. I forgot to mention that with the Pork Kalbi Bento I got earlier, there were some wheat grains mixed with the rice grains, so that was extra healthy, I suppose. This one just has plain rice. I ate my bento with this Cabbage-Cucumber side dish with a miso-sesame-based dip. 158 yen also from 3F. Also yummy.